After receiving statements of support from the likes of LA Mayor Eric Garcetti, Oprah Winfrey, Brad Paisley, Rob Gronkowski, and Courtney Love, Mr. Kimmel can add yet another name to his ever-growing list of celebrity supporters (the most important supporters of all!). 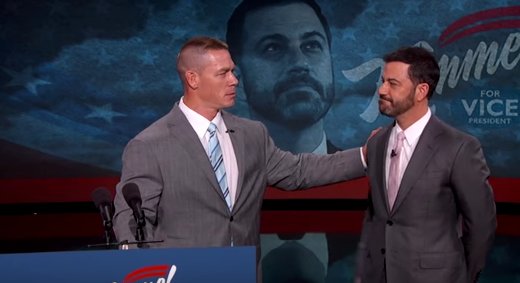 On Wednesday night, world wrestling champion John Cena stopped by during a taping of Kimmel’s show to rally voters around our future Vice President’s cause. He also broke some stuff with his big muscles.